Now is a great time to start thinking about the upcoming holidays. Canvas People just announced that they will be offering their 11 x 14 canvas for only $15 plus shipping and donating $1 for every canvas sold to fight breast cancer. I have used Canvas People to turn some of my favorite photos into a canvas. I have been very happy so far. Here is one of my favorite Halloween photos, which now hangs on a wall. 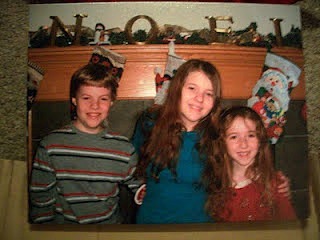 I also adore this Christmas card photo turned canvas. All 3 kids are smiling at the same time AND getting along. Now that is a great memory! If you would like to order your own Canvas Photo, click on the banner above.